APPEARANCE: Poured a slow, gurgling, dense deep oil black color. Not quite opaque leaving just enough light in to have some interesting cola brown glimmers show. Slow steady pour builds a thick, dense mocha latte colored head. Super retention I feel like I could easily float a bottle cap on this head. AROMA: Great nose on this porter, it was climbing out of the glass as I poured. Robust and rich bouquet that swirls around chocolate and deep roasted coffee. Very much a chocolate covered espresso bean, deep fudge, vanilla, mixed with the very dominate bready malt bill really does remind me of doughnuts! TASTE: Warm, fresh out of the oven chocolate fudge brownies. Lots of rich chocolatey flavors immersing itself in a fresh brewed pot of dark roasted coffee. For sure on the sweet side with subtle nuances of brown sugar, caramel and vanilla. I don’t drink this and think wow I just ate a doughnut but it’s for sure reminding me of cake and that’s close enough for me! The ending actually rounds out nicely with a coffee bitterness which brings the sweetness down a notch making it really drinkable. MOUTHFEEL: Medium plus body with a low amount of lazy carbonation. Coats the mouth well in a slightly creamy texture that ends pretty fast, slight dry with nice coffee bitterness. OVERALL: I’m a huge doughnut lover so I have been wanting to drink this beer for a while now. I was not disappointed, even though the tasting notes don’t scream doughnuts. It does drink as a really great dessert beer. 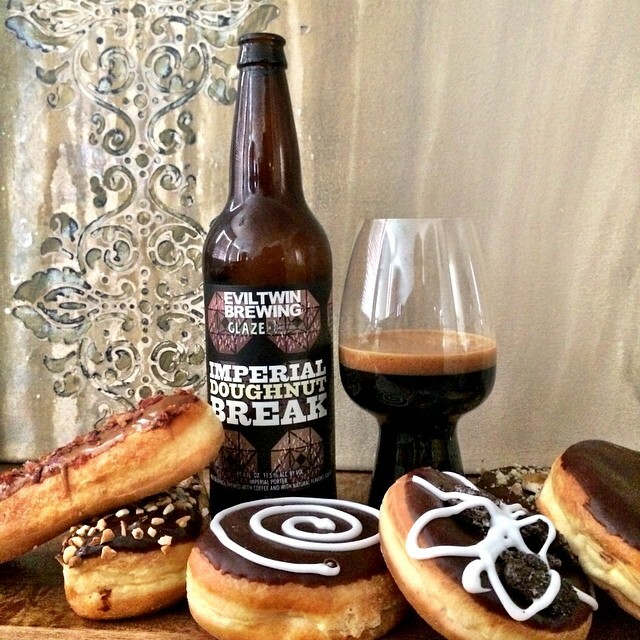 I ate a few of the doughnuts in the picture with it and found it paired perfectly, the heat from the 11.5% abv cut the sweetness just enough that it made it work. Until next time, – Support your local Beer Zombies! This entry was posted in Beer Reviews, Stouts/Porters and tagged #beer, #beergeek, #beerme, #beernerd, #beerporn, #beerreview, #beerzombies, #craftbeer, #craftbeerlover, #doughnut, #dtlv, #eviltwin, #lasvegas, #lv, #porter, #sincity, #zombie, #zombies, chocolate fudge brownies, doughnuts, Evil Twin Brewing Imperial Porter ABV, Imperial Doughnut, roasted coffee by beerzombies1. Bookmark the permalink.